Revitalize mobile offerings to drive significant increase in mobile revenue, with a delivery focus on iPad application. 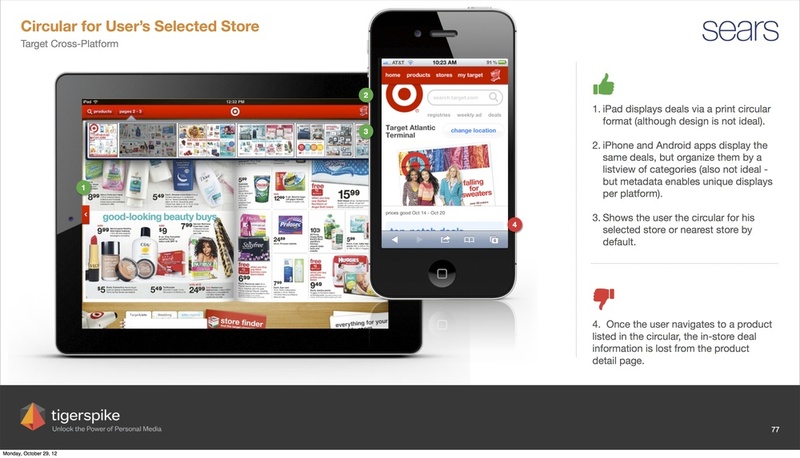 Create iPad app to address business goals of quick product discovery, legacy catalog integration, and socializing shopping. Support new digital general manager to push his brand and creative team to better understand mobile customers, present a unified mobile brand and align value proposition to customer perception. Help leverage the heritage brand reputation of catalogs and usher catalogs into the digital era. Present retailer competitive analysis including direct and indirect competitors. Create user personas, strategy and mobile brand guidelines to focus delivery team. Support staff to deliver development ready assets (wireframes & design) to hit launch date. I created a competitive analysis brief and matrix to measure overall user experience and core feature implementation for six retailers, evaluating them based on Sears business and user goals: quick product discovery, legacy catalog integration, and socializing shopping. Competitive research informed strategic recommendations for Sears to enhance their native mobile products. Highlights competitor strengths and weaknesses based on comparative feature sets for retail applications. 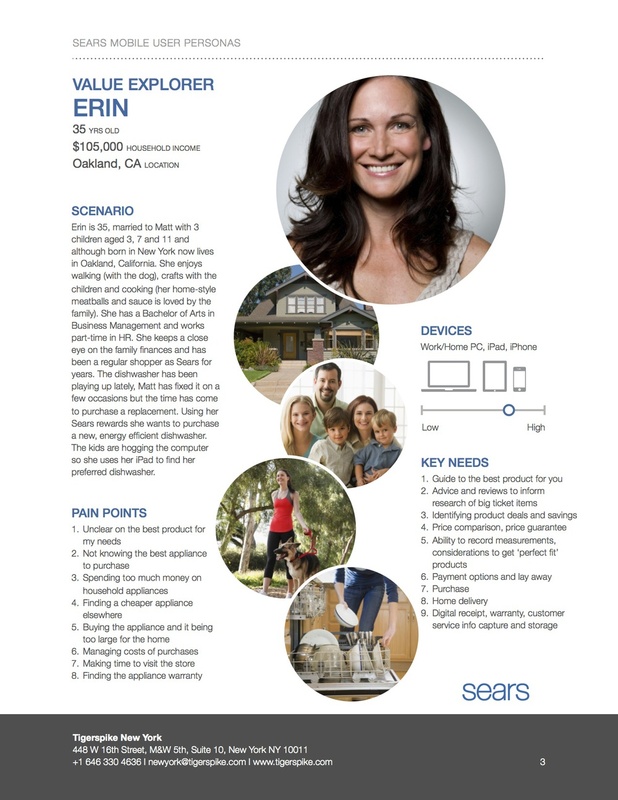 In conjunction with Domnique Lee, I defined four Sears user personas to guide design considerations and priority for launch. I lead application goal definition, sketched tablet interfaces, delivered development ready wireframes for key sections and concepts for catalogs. Throughout the project I worked directly with the client team on-site in Chicago collaborating with and presenting to key stakeholders. To address the need for quick product discovery we recommended moving the navigation from the top rail to the left rail due the tendency of users to hold a large tablet with hands on the left and right of the device. For search, browse and filter we also used a persistent slide out menu provides a two-panel navigation through the digital shopping experience. This solution will enable scalability and user context for "pogo-sticking" behavior. This element disappears in other sections providing as little chrome as necessary for immersive experiences. We recommended moving the navigation from the top rail to the left rail and enabled a two-panel navigation for the shopping experience. Product feature for tablet catalog concept. Collections boards enhance standard shopping lists, providing an opportunity to socialize and curate Sears products and content. Johanna Kenney and Chad Wetherbee delivered style tiles and design concepts to be iterated on and refined by the Sears creative team. Final iPad design delivered by Sears. At conclusion of our contract the internal staff absorbed the project to deliver in 2013. Application is in production.